Wow... this is gorgeous! Glendon Place has a new piece that should put you in the musical mood at Christmastime! 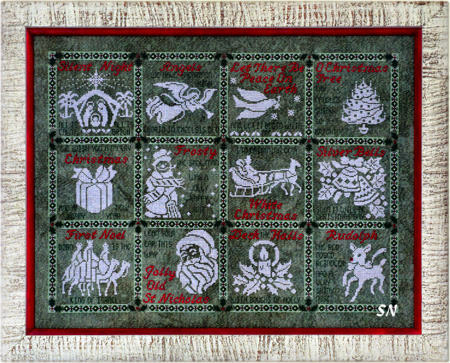 Celebrating vintage Christmas Carols, there are 12 blocks in this 291 x 220 design -- you can stitch them individually or all together. 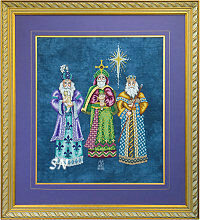 Each is stitched in white and features BITS of metallics, beads or red lettering -- not much -- just accents. The fabric is the COOLEST! 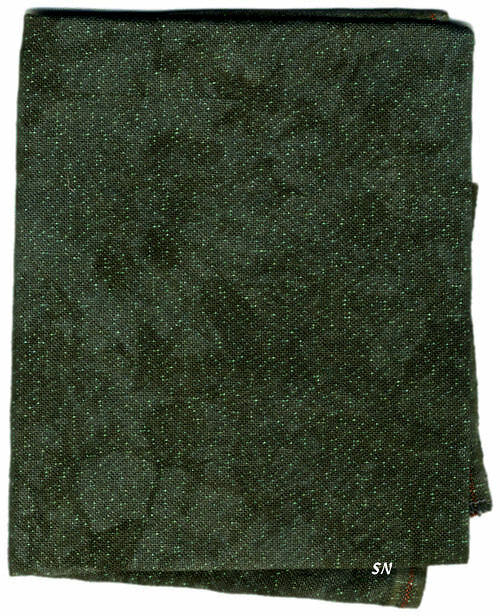 By Picture This Plus, it is a deep green hand-dyed 28ct Cashel Linen that has opalescent running through it. It is just yummy, sparkly, and a DEFINITE for this design. NOTHING else will do, so we are offering the fabric along with this chart. 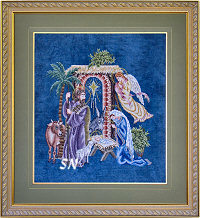 The cut is 1/2 yd, so it includes enough fabric to stitch at least three individual ornaments in addition to the main piece. Plenty, though, if you want to stitch only some of them. Celebrated Carols include: Silent Night, Angels We Have Heard On High, Let There Be Peace On Earth, O Christmas Tree, We Wish You A Merry Christmas, Frosty The Snowman, White Christmas, Silver Bells, First Noel, Jolly Old St Nicholas, Deck The Halls, and Rudolph the Red-Nosed Reindeer. Wow... you won't want to hide these eggs before Easter! Glendon Place has outdone herself with this colorful medley of beautifully decorated eggs! 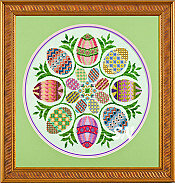 Eggs Ala Round features 16 different eggs -- all coded for 45 different DMC or Anchor flosses, 9 metallic #4 braids, and 12 colors of Mill Hill beads and even Gentle Art's Spring Grass hand-dyed floss for the greenery. Finishing approx 13 inches round on 28ct linen, I think what makes this piece so incredible is that almost all the eggs are designed on a diagonal, which is really hard to do! So many different stripes and spots, each little egg is charming just by itself! Wouldn't they be pretty stitched (even on several different colors of linens) and finished into egg shapes, and all tucked into a basket of Easter Grass? The larger eggs all measure approx 2-1/2 x 3-1/2 while the smaller ones run a bit over 1 x 1-1/2 inches. Just pretty, pretty, pretty! Offered as a leaflet. This is quite the busy 'party-house'... all decked out for Halloween! 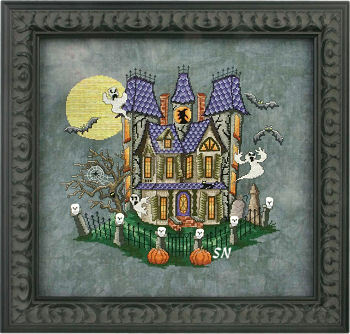 By Glendon Place, Murky Manor finishes a whopping 12 x 13 inches, and is stitched in 47 shades of DMC with touches of metallics and beads. The colors are bright and bold, and the general activity of the house is charming! See the skulls on the fence posts? You can either stitch them, or use Just Another Button company's skull buttons!!! Very festive! What a fun parade of Halloween characters! 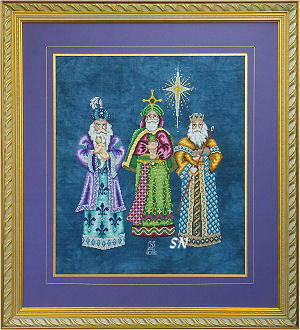 Offered in two different color-ways, you can stitch the colorful version, or do the silhouettes in just black and purple. Kind of neat that the same design can look so different, with simple a simple color change! 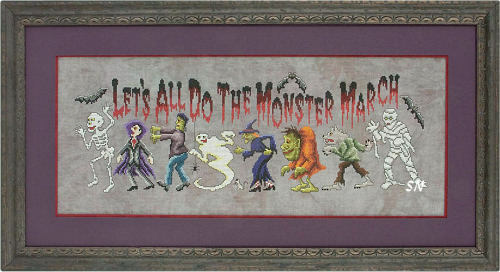 Finishing approx 6-1/2 x 21 on 28ct, wouldn't this be a cool pillow to stash on your couch at Halloween? You could even change the words, and label it for your family! Like 'Welcome to The Legeners' or put names below specific people, especially if they match personalities! 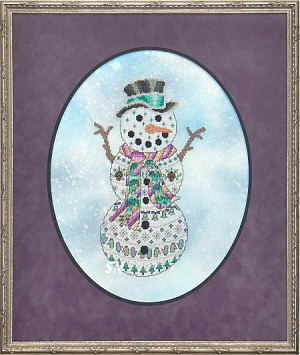 A charming couple of Snow Mr & Mrs... each is offered as a chart and finishes approx 6 x 11 on 28ct. 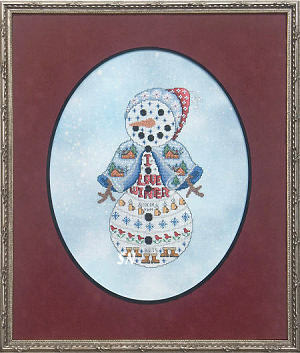 Actually, little band samplers packaged inside a snowman personality, her cape and his scarf are particularly charming. 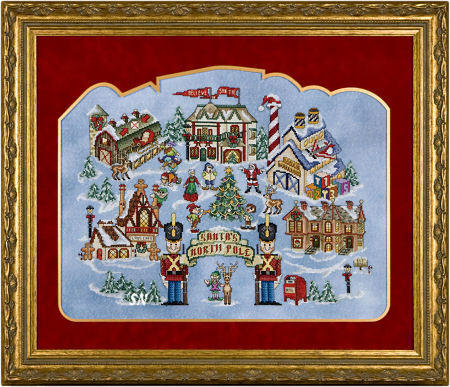 This is quite the bustling village... stitched in *only* 106 different colors of DMC floss!!! Welcoming Nutcrackers at the gate to the city, The Claus Cafe, Elf Lodge, Santa's Workshop, and the Reindeer Barn all surround the central Christmas Tree -- the heart of the village. 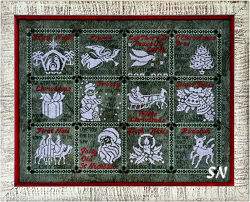 Offered as a chart... you get all 8 pages in one continuous sheet of symbols and backstitching for ease in motif placement. Cheryl notes that nothing in this design overlaps anything else... so it's a perfect option to re-arrange onto a tree skirt, or something like that! Use all the individual trees over and over again.. change the dress colors on some of the people.. get creative... and make something spectacular for NEXT year!!! 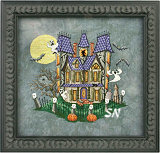 Simply charming, there are lots of cute details in here, and stitched as is -- this finishes approx 13 x 17 on 28ct. If you decide on a 10ct tree skirt, your buildings will measure approx 8 to 10 inches each... PERFECT!!! Get the pattern, study it a bit, and make your plan!!! Nothing else to add to this! 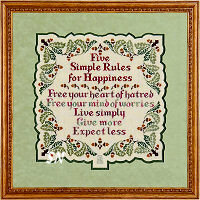 Offered as a chart, this finishes approx 16 x 16 on 32ct, but can be stitched on anything you want!!! 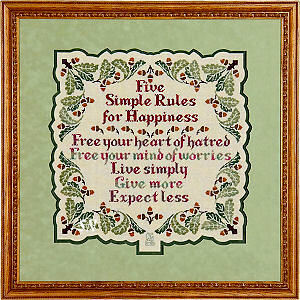 Worked in Weeks Dye Works flosses... each of the rules is stitched in a different color of Wildflowers thread... but think about following rule #3 and simplifying that a bit! The gals in the shop LOVE the Weeks colors used in this piece, and we thought the Autumn-inspired colors carry the rules perfectly! Simple, very classy, the oak leaves and acorns in the border are graceful and flowing. A pair of designs, NOT for the 'weak-of-stitcher'... these two feature 85 and 50 colors of DMC floss, numerous Kreinik metallics braids and lots of Mill Hill beads! Each finishes approx 14 x 15 to 17 inches. 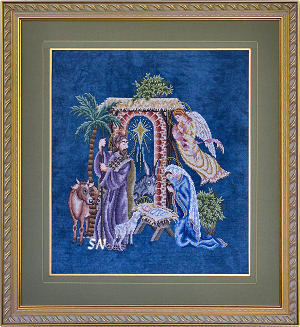 Loads of color shading, glitz in all the right places, and lovely design balance -- especially in The Nativity -- each is offered in chart format. Have you ever seen a more festive collection of pumpkins????? 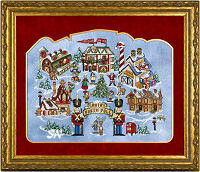 New from Glendon Place is this such an incredible design full of 52 colors of 'good ol DMC' floss! 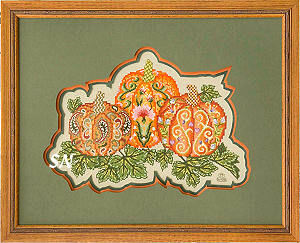 Swirls and paisleys, checkerboard stems and shaded leaves, the color and details are just wonderful! Stitched on a light-ish green -- you can use hand-dyeds or some of the Zweigart green linens -- this finishes approx 10 x 15 on a 32ct. 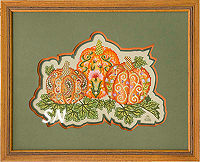 Just gorgeous, you could get ambitious and stitch the entire thing, or simply the right or left pumpkin by itself. Offered as the chart, it's a definite -- at least for your stash, if not your walls!